Yesterday, I asked people to send me free software I’d not heard of. The first suggestion was a program called beets, which bills itself as “the media library management system for obsessive-compulsive music geeks.” — sounds good to me. Today, I got an email with a download code for the new Jenny Owen Youngs album, An Unwavering Band of Light — one of the good things coming as a result of the Kickstarter from last year. Installing beets is as simple as typing “pip install beets” — but installing pip itself might be harder. I was able to type apt-get install python-pip — but if you’re on Windows or a Mac, you might have a harder time. Installation instructions for pip might help you out. Next, download your new music. Buy your copy of An Unwavering Band of Light — I opted for the FLAC version, but the procedure is the same for virtually any format. When it arrives, unzip it into a folder, doesn’t really matter which. 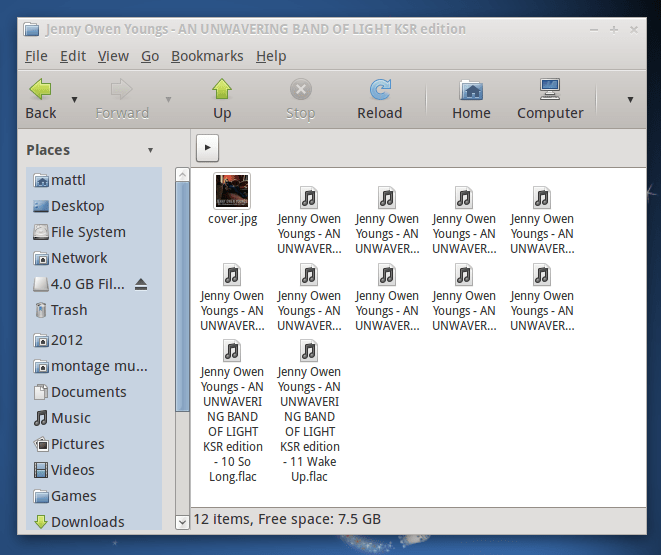 My unzipped album, in all its machine-generated filename glory. Stand back, here’s the magic. I have all my music in a folder called “Music” — you probably do as well. I fired up a terminal, typed ‘beet -d Music imp’ and then dragged the unzipped folder into the Terminal. This is UNIX, I know this. Ta-da, magic. Now I had to agree to the changes beet was going to make — renaming a few of the files slightly — I just hit Enter to accept all the changes. That’s it. The music is now in my Music player. Not only are the filenames fixed, the metadata is fixed too. I'm onto Track 6 by the time I got this posted. It's all very good. Next: Next post: New Order are touring? Not if you ask me. FWIW, the people running Debian Wheezy/Sid can install beets directly from the official repositories. Also, if your music directory really is ~/Music, you can omit the -d option, since it is the default value :-). Other than that, this blog post remarquably demonstrates how easy it is to use beets. Nicely done!